A few years back, a really bad attack of pimples had left behind a few scars on my face. 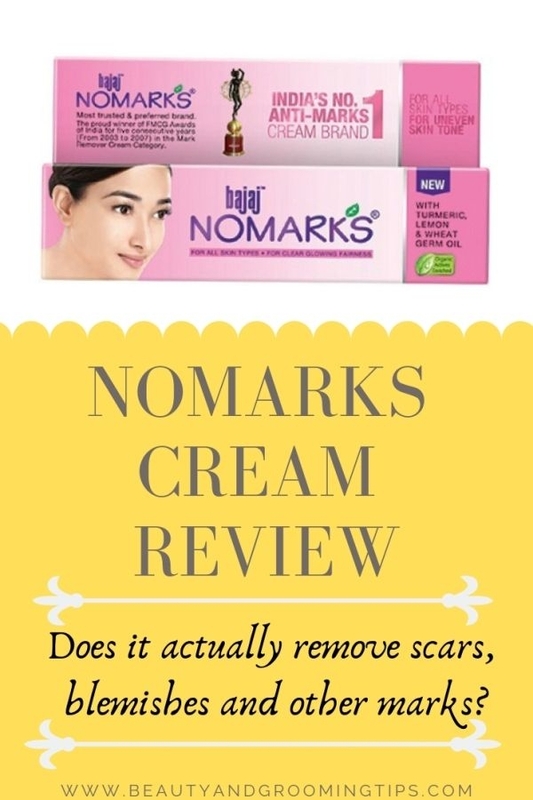 At that time, I had purchased ‘No Marks Cream’. If I remember correctly, this cream had several natural ingredients such as Aloe, Damask Rose (Rosa damascena), Turmeric (Haldi), Sandalwood (Chandan), Tulsi (Basil) and wheat germ oil to name a few and besides doing away with scars and other blemishes, this cream’s formulation was supposed to diminish and gently fade under eye dark circles, post pimple marks, minor burn marks and stretch marks. It was a fragrant cream and when applied on the skin, it felt soothing and cool. I had used it for more than a month, but it did little to lighten the spots left by pimples. I did try some home-remedies later and they were much more effective than this cream. Perhaps if I had used this cream for a longer period, it would have yielded better results. Nonetheless, I was not at all satisfied with the results after using this cream. It somehow didn't work for me. Thanks a bunch! I appreicate honest reviews that save my money! Moisturizers may help to prevent stretch marks, but nothing has been scientifically proven. Vitamin E and A are key components in the growth of new skin cells and may help to reduce the appearance of stretch marks over time. Another way to avoid or get rid of stretch marks is to not gain a lot of weight and massage your skin on a regular basis. Its also important to check anti wrinkle face cream ingredients. That being said, make sure you know what you’re allergic to before buying and using anti aging skin care treatment. 1. Apply sandal wood powder mixed with rose water leave it over night and wash it in the morning. 2. Apply turmeric powder mixed with curd if you have oily skin or use milk if you have dry skin. 3. You can also go for laser treatment for removing scars. 4. If you are looking for a good face wash to remove scar then try using Himalayas neem face wash.
5. Dandruff in head may also cause pimples so use white pepper powder mixed with curd for removing dandruff. use moisturizer. the reason pimples happen is because of oil/impurities, which happen from DRYNESS, so use a good one. i used to use this one from Freeman Feeling Beautiful, but they don't have it anymore, but you could probably find a similar product from them. Anytime you gain or lose weight, even if it's only a partial pound, you get a stretch mark. There are no diseases that cause them. Some stretch marks will fade over time. Mederma and Palmer's Cocoa Butter can both make stretch marks appear like less of a big deal. Daily use of Olive oil is also known to reduce stretch marks. use bio oil twice a day and u will see the results with in a month.